Oh, boy. Here comes a dessert recipe, and it’s a big one. Do you have a special occasion handy? You’re gonna want to find one fast. Like, um, Columbus Day. Everyone celebrates Columbus Day with a giant cake, right? Let’s make that a thing. Or, according to this Bizarre Holidays calendar, just six days from now it’s “Moment of Frustration Day.” You’re definitely gonna need cake for that. 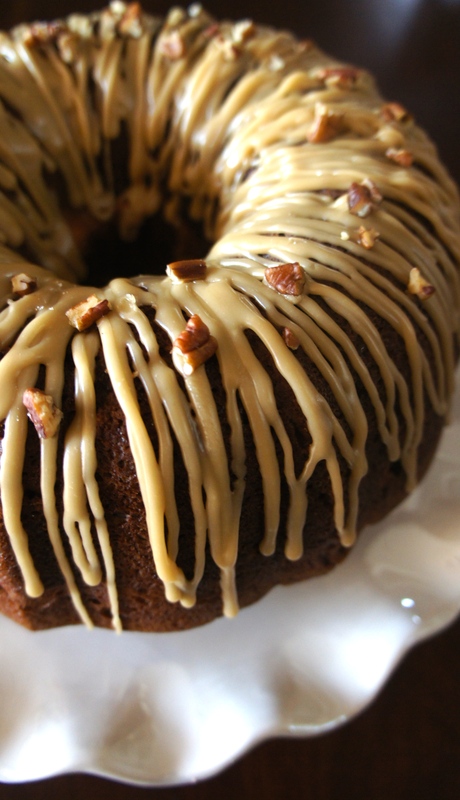 This Apple Cream Cheese Bundt Cake with Praline Frosting is an over-the-top delicious way to celebrate Columbus Day, or National Dessert Day (October 14th! Perfect! )–or just to savor the apple-cinnamon flavors we Northern Hemisphere-ites associate with fall. Having loaded up on 15 pounds of apples at Date Creek Ranch during their apple picking festival last month, I’ve been on the prowl for apple recipes. It’s been applesauce/apple tart/pork chops and apples mania around here, and surprisingly, none of us seems to be sick of it yet. I actually made this special occasion apple cake for my mom’s birthday back in August, but am considering it for our hurrah with the one pound or so of Date Creek Ranch apples we have left. This cake is dense, rich, and chock full of apples. 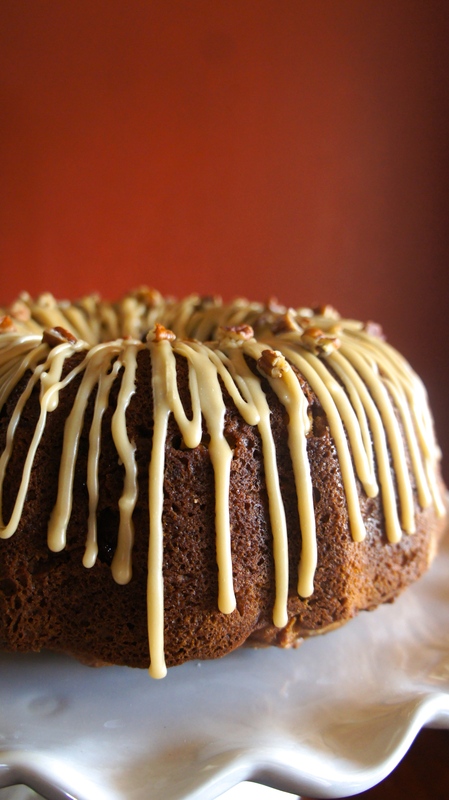 The sweet praline frosting and cream cheese layer offset the density of the cake itself with a smooth sweetness. It would be delicious with or without the cream cheese layer, too, so feel free to leave that out if cream cheese isn’t your fave. 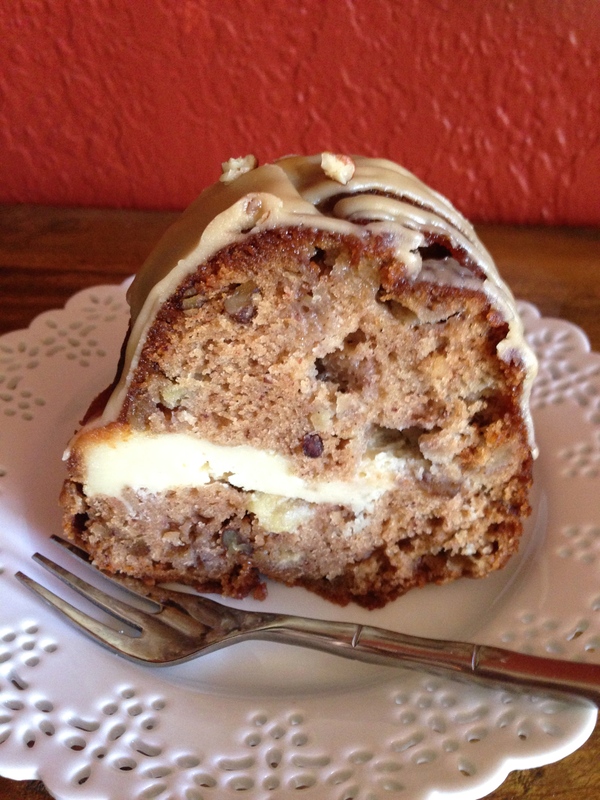 …APPLE CREAM CHEESE BUNDT CAKE! Make the cream cheese filling: in a medium bowl, beat softened cream cheese, butter, and sugar with an electric mixer until smooth. Add egg, flour, and vanilla and beat until just combined. Set aside. Make the cake batter: Preheat oven to 350 degrees. Place pecans in a shallow baking pan and bake 5-7 minutes until toasted, stirring once halfway through. In a large bowl, combine flour, white sugar, brown sugar, cinnamon, nutmeg, allspice, baking soda, and salt. Stir in eggs, oil, applesauce, and vanilla and mix until just combined. Fold in apples and toasted pecans. Grease and flour a 14-cup Bundt pan. Spoon 2/3 of the apple cake batter into the pan, then top with entire cream cheese mixture, leaving a 1-inch border around the edges of the pan. Use a skewer, toothpick, or paring knife to swirl the two mixtures together slightly (or skip this step if you don’t care for a marbled effect.) Spoon remaining apple cake batter on top of cream cheese mixture. Bake in preheated oven 1 hour 15 minutes until a tester inserted in the center comes out clean. Cool cake in the pan on a wire rack 15 minutes. Remove from pan and cool to room temperature on the wire rack. Yum! I am not a big cake eater, but this looks delicious! 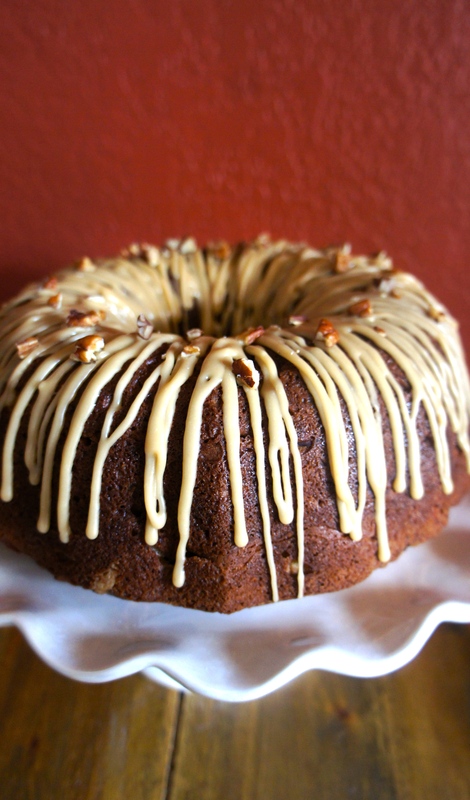 There is something so special and festive about a bundt cake.